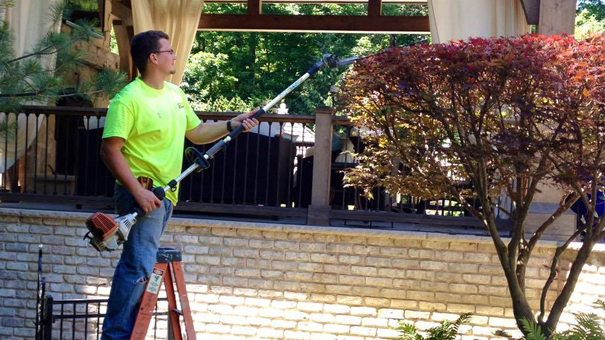 Perfection Landscapes is a full service landscape maintenance company in Cleveland, OH. Along with our design and build services, we also offer landscape maintenance. We provide landscape maintenance for residential and commercial properties in the Cleveland, Ohio area. If your landscape needs a maintenance or repair service which is not listed, please contact us with your needs. Once you contact us with your Cleveland landscape maintenance needs, one of our professional staff members will meet with you to see your property and plan out a maintenance schedule that will keep your property’s landscape looking great all year round. Perfection Landscapes is happy to manage any landscape no matter how simple or complex it is. We will stay within your budget, be there when scheduled to be at your property and care for your landscape as if it were our own. Our professional and courteous Cleveland landscape maintenance staff is always here to answer any questions that you may have. “Perfection Landscapes has been maintaining my property for the past 5 years. Their employees have been extremely reliable, efficient, and cordial. They take pride in their work.